Bogle was the best chief executive officer in fund history, and second place isn’t even close. He began in the right place: attempting to create top-notch products. That advice sound obvious, but in the ’70s it was not. Many leading mutual fund companies offered mediocre funds. This condition persisted through the ’90s but has since expired. The Internet applied the final blow. Mutual funds, and their offshoots, exchange-traded funds, were already the most closely measured of consumer purchases. Marketers could talk vaguely about their automobiles’ superiority or their diet pills’ benefits, and prospective buyers would have difficulty distinguishing between fact and fiction. Not so with funds. Their attributes could be scored and–during the Internet age–easily obtained. Bogle did not foresee the Internet–a technologist he was not (it was only last year that I first received an email from him directly, not dictated to an assistant, and it came via a BlackBerry), but he did expect that the truth would emerge. He believed that if Vanguard’s funds treated their shareholders better than did other companies’ funds, the marketplace would recognise that achievement, although it might take a long while. He was correct; most other fund company CEOs were not. That is what occurred. What’s more, Bogle astutely minimised the possibility of bad luck by hedging his portfolio-management bets. Rather than use a single subadvisor for a Vanguard stock fund, he began to hire multiple advisors. The more advisors he brought aboard, the more he muted the fund’s relative risk. Increasingly, the fund would behave as did the collective–before expenses. It would therefore outdo them after costs. However, as Bogle recognised, that precept works in both directions. There are limits to how well most of Vanguard’s actively managed funds can perform in a given year–but also limits to how far they can lag the category averages. Vanguard was built to avoid errors. 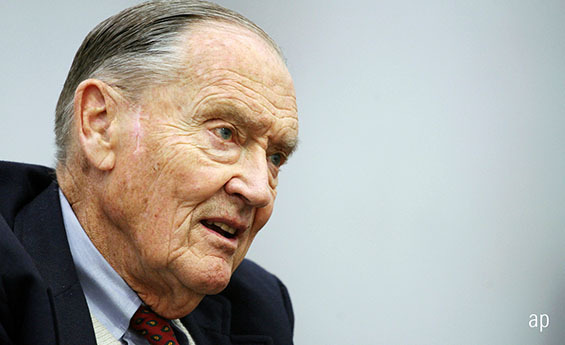 Bogle’s specific decisions are not useful guides for today’s fund company leaders. Conditions have changed. The dominant firms in the fund industry are very different from those of the ’70s, when Vanguard was formed. But the principles, I think, are similar. A great fund company CEO is one who: 1) aims high when developing funds; 2) succeeds in that goal; and 3) tirelessly, and effectively, spreads the word.